A recent conversation in the library with a visitor from Emu Plains made me curious about the subject she was researching - special trains that ran straight to the Wagga showgrounds early last century. The local studies collection has a slim volume of the history of the Wagga Show on the occasion of it's 100th year, written by Keith Swan and mentions the "cheap excursion trains" coming from nearby towns such as Albury, Urana, and Leeton. Swan's history has the showground siding being completed in 1889. This excerpt from the Daily Advertiser (left) has details for a day's rail timetable in August 1925.
devoted a large amount of the front page space to the events and details of the 61st annual show, giving a lively description of the day's events , morning to night. 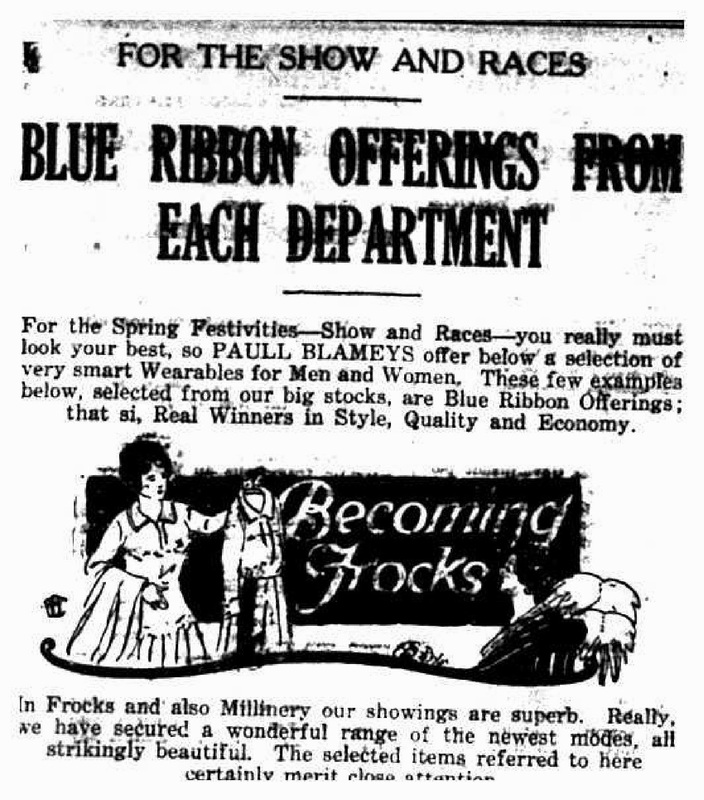 1925 was the year that "the spirit of spring permeated the air", with records broken in attendance and takings at the gate, and the year that "congestion" in the cloakroom was "so great , that a police officer was was given the duty of seeing that order was maintained". Local businesses also got on board the the Show bandwagon, (right) offering special deals while the Show was running, many businesses having displays at the Show itself. This was also the year a restroom in the form of a tent was run by the Country Women's Association and the Church of England, to much critical acclaim. Jimmy Sharman's Boxing Troupe also visited when the Show was on, and theatres and other venues took advantage of the influx of visitors to the town, presenting vaudeville, comedy nights, dramatic plays from travelling acting companies, and bands played on the pavement in the evenings outside the theatres to attract customers. http://www.wagga.nsw.gov.au/library/wagga-history/links to take you straight to some of the Wagga Wagga newspapers available through Trove.